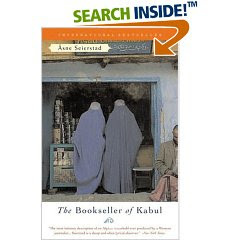 Another standard book club pick, this non fiction expose describes life of a fairly well off book seller and his family in post 9/11 Afghanistan. Sultan has struggled all his life (and even gone to jail) to maintain the written word in his country despite the Taliban and/or government pressures to eradicate all forms of modern culture and ancient literature. Norweigan journalist Seierstad spent several months shadowing him and his family and paints a really depressing picture for modern Afghani women. Sultan's youngest sister Leila has a particularly suffocating and bleak life. Honestly, the book was written well and has a lot of information about the political history of the country, but MAN is it a downer.